So everyone knows that we have a problem with members who don't report inactivity and don't show up for a week, weeks or even months. To make things more clear and less complicated I want to introduce to you the method I will be working with. The characters in the brackets are simply a representative of the member's level in our forum. 1. 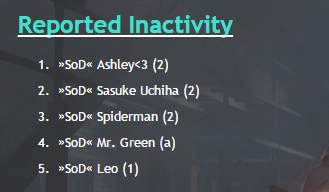 Reported Inactivity, members who will report an inactivity will be placed on this list and will be removed a while after the inactivity is done. 3. Members who wish to extend their inactivity period simply mention the extended date in their inactivity thread. 4. Members who will not extend their inactivity will be removed from the "Reported Inactivity" list, their thread will be locked and will need to open a new inactivity thread if they will be inactive. In addition, they will be placed back in their list whether it's level 1 member, 2, admin or trial. An activity check is done once in a while to see who's inactive and who's not. 5. Members who will have a very long period of inactivity who are ABOVE level 1 member will be demoted in order to give other's who are active a chance. It is done not because of anger or rule breaking but giving everyone a chance. 7. Members who will fail reporting an inactivity report will most likely be removed as members and in rare cases only demoted due to the inactivity. Feel free to post here questions if there are any. Post was edited 4 times, last by “Cody” ( Jun 16th 2015, 1:13pm ).